A place on the World Championship start line is just a weekend away for the best of Britain's athletics talent. About 700 athletes will descend on Birmingham knowing a top-two finish will earn them their spot at London Stadium in August, providing they have matched the qualifying standards before 10 July. World champions, such as Mo Farah, or Diamond League series winners, such as Laura Muir, are given a pass into the World Championship team, but there is little leeway for anybody else. 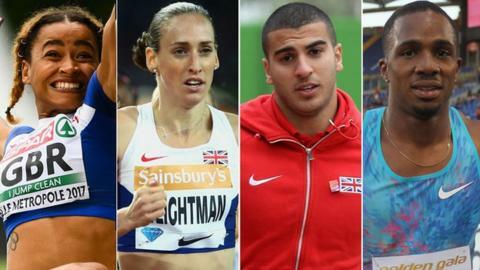 Finish outside the top two and the likes of Adam Gemili and Dina Asher-Smith know they will have to rely on the discretion of the selectors to fill one of the few remaining slots. BBC athletics commentator Steve Cram, a former 1500m world champion and Olympic silver medallist, picks the races to watch out for at the Alexander Stadium. Nethaneel Mitchell-Blake is the fastest Briton in the world this year - having run 9.99 seconds in the United States in May. He is a really exciting talent, but he may well concentrate on the 200m. The thing about the trials is it is not about those headline times. It is about turning up on that weekend and delivering with the added complication of negotiating the rounds as you have to do at the World Championships. It kind of sorts people out. It is about beating people in races, rather than laying down times. CJ Ujah has been doing that - seeing off France's Jimmy Vicaut in winning at the Diamond League meeting in Rome and coming a close second to Canada's Andre de Grasse and ahead of domestic rival Adam Gemili in Oslo. It could be that the seasoned campaigners like him come to the fore. Asher-Smith - the 2014 world junior champion and 2015 British champion over the distance - fractured a foot in February and I hope the selectors have told her to get herself right rather than putting pressure on her to qualify at the trials. Even if she doesn't run all that well, if she just runs the qualifying standard, she should be able to get in. Desiree Henry started the season really well with an impressive 11.09 in the United States, but has not been as quick on recent outings. Daryll Neita is only 20 and has been selected in the team for the European Under-23 Championships in July, but has lowered her personal best to 11.20 and may well put her hand up for the senior championships. Bianca Williams is running well as well. Somebody is going to miss out. This race is absolutely fascinating. Six of those involved have achieved the qualifying standard and it will be a fabulous way to bring the meeting to a close on Saturday evening. Danny Talbot is running really well, Zharnel Hughes is a massive talent and Nethaneel Mitchell-Blake has already run faster than anyone. It is Adam Gemili - who finished a fraction away from a medal in Rio - who is looking a little wobbly at the moment. But you need to weigh up the fact the likes of Mitchell-Blake and Hughes are not UK-based. Running well in the big collegiate events in Florida in March and April and then peaking again, in very different conditions, for the UK trials is not easy. That is why people who have done it in the past - the likes of Talbot and Gemili - will fancy their chances and back their experience. I think Talbot could be the one coming under the radar here. The big names and new kids on the block attract all the attention, but I guarantee some of them will be looking at Danny - who has come in the top two for the past three years at this event - and think beating him will be enough for them to qualify for the Worlds. For the first time in a long time, the men's 1500m looks like a really good, competitive race. Jake Wightman had a breakthrough Diamond League victory in Oslo recently but there is no guarantee he is going to get selected. Chris O'Hare, Charlie Grice and young Josh Kerr, the US-based Scot who won the European junior title in 2015, have also got the qualifying time already. Tom Marshall ran a personal best - three minutes 37.62 seconds - recently and Robbie Fitzgibbon, who was in that European junior final alongside Kerr, is not that far off the pace either. For the past four or five years, we have just had the two Lauras - Muir and Weightman - and no-one else. Muir is recovering from a stress fracture in her foot so we are not going to see her this weekend, but as Diamond League champion she doesn't have to worry about qualification. Weightman, who I coach, is running well. For the first time in ages, though, there are four others who have run the qualifying time. Jess Judd, who is next fastest behind Weightman, is down to do the 1500m and 5,000m double in the European Under-23 Championships. I couldn't see her doing both that and the Worlds, so there may be a change of plan depending on how she goes. There are another three athletes - Katie Snowden, Sarah McDonald and Melissa Courtney - who are all within a second of her, though. This is going to be another good event. There is good strength in depth here as well. Of the three main contenders this weekend, Jazmin Sawyers - Britain's top finisher in the Rio 2016 final - is lagging third behind Lorraine Ugen and Shara Proctor. Heptathlete Katarina Johnson-Thompson is not competing. But Sawyers won the British title in Birmingham last year with a leap of 6.75m, her personal best. Will the return to Alexander Stadium inspire her to similar?